Fencer combines with Maxus Helios. This four legged creature runs extremely fast and battles with its front bladed legs. Blinding light shoots from its center blue eye to stun challengers during battle. Its long whipping tail has a blaster on the tip that can rip through its opposition. Fencer has extremely strong pincers that are impossible to break free from. 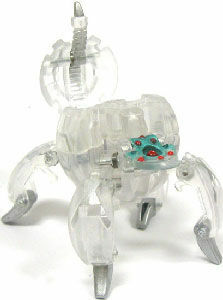 Purchase Fencer Bakugan from Amazon now!